I was struggling to get high in the serpentine thermals above the grassy pasture on the launch ridge. Some local pilots were drifting and climbing well over the back, but I was playing it safer on the front side. Then I heard Jon’s voice on the radio: this is high enough, guys, let’s go explore! And sure enough he turned and headed straight for the high snowy crags at the back of the launch valley. Pete aimed that way too. Somehow I didn’t realize that was actually our plan but I guess I was going along! I followed them for what seemed like a crazy long time. The scale of these mountains was hard to appreciate - they just weren’t getting any closer! Finally we arrived pretty low on the sheer granite face of the first peak, where a few local pilots were already scratching around above scattered snow fields. Thermals back there were strong but elusive. All I could think was, if I didn’t get up here I probably wouldn’t make it all the way back because now I’m too low! But before long we found ourselves corkscrewing straight up the stony face and continuing high over the craggy knife edge of the peak, to gaze into the steep snowy ravines on all sides. Holy crap. Can we fly back to the grassy valley now?? But then I heard Jon again. And of course he said, I’m going to head over to that big snowy peak across the valley. Oh god, why. But I was feeling high enough to follow. I followed his line across, looking down into the steepest darkest rocky gorges I could imagine, and again it took longer than I expected because the scale of this place was just so massive. I arrived lowish on the next steep rock wall but I didn’t feel too freaked out because there were actually a few people struggling lower. I was ripped skyward in a super strong thermal, barely holding on to it, and then I was high above another sharp rocky peak and hoping it was time to head back out to the nice lake at the LZ. I turned some circles with Pete but he soon climbed away and left me. My radio crackled with a familiar voice. Let’s hop back a little deeper now! Oh come on. Really?? Sure enough we hopscotched our way across a couple more snowy peaks, climbing like crazy, sinking like crazy, climbing again. What were we doing back here? Farther and farther from the comforting grassy foothills, nothing but sharp rocky teeth below, dotted with turquoise icy pools and streams from the snow melt. Then at last my radio delivered the welcome words: guys, I’m cold and happy and ready to head out! Oh me too me too! Wait for me I’m coming too! I could see Jon way ahead, a speck in the green distance, and I looked back and above to see Pete way overhead and deep over the forbidding peaks, a speck in the blue distance. I slowly edged my way out of the mountains towards the welcoming hazy green foothills, where Jon and I explored together along the pastured ridges on the other side of the launch valley, before finally making our way down to land at the lakeshore, joined soon after by Pete. Whew! We folded our wings in the long afternoon shadows and watched scores of other happy pilots landing and chattering away in French about the day's epic conditions. I didn't understand many of the words but the meaning was pretty clear from the tone and the gestures! We retired to a nearby brasserie and Jon ordered us a cold refreshing bottle of dry rosé while we compared notes on our flights. I forgot to take notes of course because I was too freaked out the whole time. All I could remember was, oh my god, snow, ice, pools, craggy peaks, deep ravines, oh my god! But after a glass of wine my nerves settled down a bit and I started to feel pretty heroic to have survived. After another glass I was actually feeling like, yeah, I got this, let’s do it again! And sure enough we did do it again, a couple days later. Maybe I was a little less freaked out the next time. Or maybe not! How do you say road trip in French? It's a trick question: turns out they just say “road trip” but with a French accent! I think it’s very likely they say Rat Race the same way. While most of Hawaii’s pilots were at the Rat Race in southern Oregon, I was bucking that tradition to enjoy a two week paragliding road trip with my buddies Jon and Pete, driving long distances to connect several mountain ranges in France, not to mention shortcuts through Switzerland, Spain and Italy, plus a day’s excursion to the tiny nation of Andorra nestled deep inside the Pyrenees. Including some minor excursions, we drove for a grand total of around 35 hours on five driving days, covering 2,500 km, in a fun and sporty diesel stick shift SUV that was the perfect size to cram three pilots and their gear. We stayed in five different places. We had eleven full days to fly and we flew six of them. On the others we hiked or explored, and on one rainy day we actually just relaxed! On open highway the speed limit was often 130 kmh, but of course folks were sometimes driving faster, so we did too. Sure it felt fast, but I didn’t realize til later that we were probably hitting 100 mph. Yikes. At least we were on the proper side of the road! On the plus side the French drivers are unbelievably well behaved, conscientious and predictable, with everyone moving as far to the right as possible to allow faster traffic on the left. We didn’t drive quite that fast on the winding mountain passes but it was just as well because the scenery was mind boggling and worth slowing down for. Seems like I end up flying in France every six years or so. After a month home from this third trip over there, I have to wonder why it takes me so long to get back each time. Definitely something to work on! Mad Dog has gone every year for like 40 years. Now that’s the way to do it. The funny part is he still hasn’t learned a word of French! I’ve been on two memorable Mad Dog tours to France and they were both to Chamonix (with occasional day trips to Annecy). After his countless visits to France, Mad Dog has that place dialed as far as the cheapest time of year, the places with great mountain XC flying, clear weather, ski lift logistics, lodging, and food. But for this third trip I had the opportunity to try something different: the Jon Goldberg-Hiller and Pete Reagan tour. 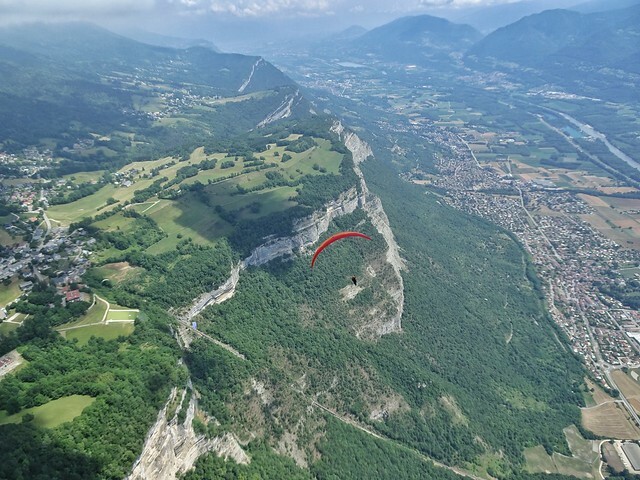 Jon has spent the last ten or so summers chaperoning UH students on their annual exchange program in Annecy, and during those trips he’s flown all over Annecy and Chamonix/Plaine Joux and other spots in the Haute-Savoie department of the French Alps. But this summer he was curious to try flying some of the other mountains that’s he seen on his many travels around the country for his work, so he cooked up a plan for a flying road trip for the two weeks ahead of this year’s Annecy chaperone gig. Jon and Pete are flying buddies from the dark ages of paragliding, learning to fly together under bedsheets and ropes when people were first trying out this new French sport in the mountains of the US Pacific Northwest. Jon eventually founded the Cascade Paragliding Club and later moved to Hawaii, while Pete continued to climb mountains and work as a family doctor in Portland. Not to mention flying the Cascades and the Canadian Rockies as often as he could. These are a couple of the most mild mannered and sweet fellows you could ever meet. But their mild manners belie their fierceness in the air. Both of them have flown deeper lines than I prefer when I’ve flown together with them at home in Hawaii, and on this trip they continued that pattern! At least I have a few years on them to keep working on my flying fierceness. We visited several widely scattered flying sites: we spent a few days at Vallouise in the Massif des Écrins of the Dauphiné Alps, a few days at Saint-Hilaire du Touvet in the Chartreuse range of the French Prealps (site of the Coupe Icare each autumn), plus a quick visit to Chamrousse across the valley in the Belledonne range, and a whole week in Val Louron in the highest part of the French Pyrénées range. Vallouise was the most intriguing in terms of flying possibilities over ridiculously scary and severe glaciated mountain terrain, but the weather there was also the trickiest during our stay, and we only saw one day of morning sled rides. 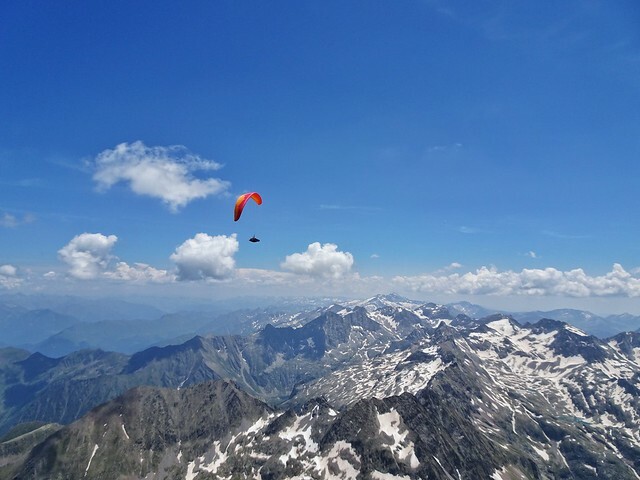 But that whole area is breathtakingly beautiful and there are scenic and famous flying sites all over that region, from Briançon to Saint-Vincent-les-Forts. I have to get back there for a longer stay! Saint-Hilaire is notorious for weak flying weather during Coupe Icare each autumn, so I’m not sure why that’s when they hold it. Maybe just because it’s least likely to be rainy at that time. Turns out summertime is pretty decent there, in between high pressure and thunderstorm days, while springtime is the epic XC season. We enjoyed several days thermaling all over the plateau there but low clouds kept us from going too far. We also explored the Chamrousse site across the valley but on that day no one was flying there. We did meet quite a few local club members who were there to check it out, and we saw a couple of pilots flying past us on a mysterious XC flight from some other place in that mountain range. What an interesting looking place that is. I have to get back there for a longer stay! Our luckiest timing for weather was in Val Louron, down south in the heart of the French Pyrénées, bordering Spain. Mad Dog has spent some time flying in nearby Bagnères-de-Luchon, and it turns out old time Hawaii pilots Marc Hill and BJ have also flown there. As far as I can tell, the Pyrénées are not known for long straight distance XC flying. In fact I’ve heard folks say that one kilometer in the Pyrénées is worth two in the Alps! XC pilots tend to log triangle flights there. On the day we arrived after a marathon drive from the north, people were landing after what they said was an epic day of cross country flying. We could only hope for a day close to what they described. Lucky for us the next day was the same or better, and as described in the first few paragraphs above, we made our slow but steady way around what turned out to be a textbook valley tour, rising to some rarefied heights over crazy glaciers and alpine lakes. Jon and Pete charged deep and high and I did my best to tag along! A couple days later we had a day that seemed less promising but turned out to be pretty decent. We enjoyed less ambitious local thermal flights while some local pilots showed us it was possible to make a low valley tour. On our last day there, we were surprised by one more epic and perfect XC day, with conditions described by one local as the top five percent for the flying season. We flew the big valley tour again on this day, but deeper, higher and a bit wider this time. Certainly Jon and Pete went deeper and higher! Once again we were treated to amazing clear views above the snow covered sharp granite peaks, crazy turquoise alpine lakes with freezing waterfalls, and the tantalizing thought of Spain just past the highest peaks of the summit. We barely scratched the surface of Pyrénées flying but what a privilege it was to make its brief acquaintance. All I know is: I have to get back there for a longer stay! There are so many individual stories to tell about this trip, way too many to include here. Ask me about them sometime! Finding a random brasserie again in Genève after walking by and then deciding it was the only place that looked good hours later. An interesting meal at Chicken Alpes in Grenoble. Dinner at the mysterious Chez Lily in Germ. The thousand fly genocide. 39 degrees and the canicule. Marmots! MARMOTS! (After two previous marmot-free trips to France I thought they were just legendary creatures.) The cat that thought it was a dog. A hungry Mule. Deciding to finally eat a nice restaurant dinner and driving for hours from village to village only to realize nothing is open for dinner on a Monday night. Escaping a tragic premature end to the trip by deciding not to explore what looked at first like an interesting trail down from the bridge connecting the fortifications of Briançon. The French pilot on a Zeno at Val Louron who asked how many hours I had on mine. Swiss tunnels, and Swiss aqueducts. Refuge de la Soula. Refuge du Glacier Blanc. Our hostess Françoise in Vallouise. Wine bar in old town Annecy. My new favorite refreshments: Chartreuse, Génépi and Rosé! Delightful briefings and debriefings from French pilots Philippe and Raymond. Jon’s stolen helmet and gloves. French tutoring from Jon, and my many laughable but super fun attempts to practice on locals. The gallery girl in Andorra, and the cafe she sent us to! Our misadventures with technology: SIM cards, Android binding problems, Kobo minis running LK8000 with crazy little transponders. Getting lost and running late for our flight out of Geneva, crashing the Swiss border like hardened criminals, and somehow getting away with it. Thanks to Dorothy for the miles that paid for my flight. Twenty hours each way, stopping only in DC between Oahu and Genève. Not only that but she encouraged me to go on this trip when I was really on the fence. And huge thanks to Jon and Pete for the invite. I would never have dreamed up such a crazy trip. It was a pleasure traveling with two of the most knowledgable and interesting flying buddies anyone could hope to spend 35 hours in a car with. And I have to thank Jon for the AirBnB bookings and Pete for scoring us such a sweet ride. And to Jon for doing all the cooking. What was my contribution? Perhaps only the haphazard documentary footage I cobbled together, topped off with a few choice clips from Pete’s GoPro. Pete is working on his own video of the trip and I can’t wait to see it. It took me a whole month to scour through the many hours of footage I shot on this trip, and to put together some semblance of a video tribute to our adventure. I cut it down and cut it down some more, throwing out tons of clips that I originally thought were indispensable to the story line, but even after all that cutting it’s still an eleven minute video, my longest by a large margin. If you don’t have the patience to watch for that long, just skip to the end where I put Pete’s footage of me thermaling high over the Pyrenees. After watching those clips I just have to ask: how come no one ever told me how awesome I look thermaling in this new wing?? Thanks to Jorge for hooking me up with that beauty! Epic! Rat Race was fun, but this trip beats it easily, hands-down. Thanks for the video and for the leads that will be openers for a few stories. I forget how much fun we have in the Alps, makes me think of the Dolomiti for September. Well, this was 2 coffees and 1/2 bottle of wine later. JJJ is smiling somewhere. Great read and the videos are tempting my French itch to get back there. Thanks this was worth the wait. Time for Chamonix!! Part Deux!